"If I invest this much now and expect a fixed interest return over a specific time, how will my money compound?" People talk about the power of compounding. See for yourself how a consistent % return over time can quickly add up. Enter your starting capital amount. 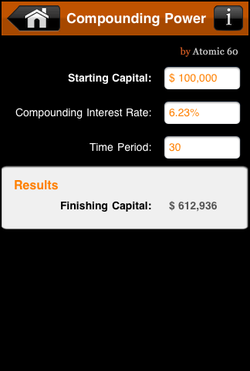 Enter your compounding interest rate followed by the amount of time to compound. Time period can be anything; compounding daily, compounding months or compounding annually. I have $75,000 to invest in my child's educational account. I expect to return 5.50% annuals over the next 15 years. Based on these estimates my child would have $167,436 at the end of 15 years.